For the article on the population of the United States, see Americans. American ancestry refers to people in the United States who self-identify their ancestoral origin or descent as "American", rather than the more common officially recognized racial and ethnic groups that make up the bulk of the American people. The majority of these respondents are White Americans, who however no longer self-identify with their original ethnic ancestral origins or simply use this response as a political statement. This response is attributed to a multitude of or generational distance from ancestral lineages. Although U.S. Census data indicates "American ancestry" is commonly self-reported in the Deep South and Upland South, the vast majority of Americans and expatriates do not equate their nationality with ancestry, race or ethnicity, but with citizenship and allegiance. President Theodore Roosevelt, a prominent naturalist, asserted an "American race" had been formed on the American frontier, one distinct from other ethnic groups, such as the Anglo-Saxons. He believed, "the conquest and settlement by the whites of the Indian lands was necessary to the greatness of the race...." Roosevelt's "race" beliefs certainly weren't unique in the 19th and early 20th century. Eric Kaufmann has suggested that American nativism has been explained primarily in psychological and economic terms to the neglect of a crucial cultural and ethnic dimension. Kauffman contends American nativism cannot be understood without reference to the theorem of the age that an "American" national ethnic group had taken shape prior to the large-scale immigration of the mid-19th century. Nativism gained its name from the "Native American" parties of the 1840s and 1850s. In this context "Native" does not mean indigenous or American Indian but rather those descended from the inhabitants of the original Thirteen Colonies (Colonial American ancestry). These "Old Stock Americans", primarily English Protestants saw Catholic immigrants as a threat to traditional American republican values as they were loyal to the Papacy. Nativist movements included the Know Nothing or American Party of the 1850s and the Immigration Restriction League of the 1890s. Nativism would influence Congress; in 1924 legislation limiting immigration from Southern and Eastern European countries was ratified, while quantifying previous formal and informal anti-Asian previsions, such as the Chinese Exclusion Act of 1882 and the Gentlemen's Agreement of 1907. According to U.S. Census Bureau; "Ancestry refers to a person's ethnic origin or descent, 'roots,' or heritage, or the place of birth of the person or the person's parents or ancestors before their arrival in the United States". According to 2000 U.S census data, an increasing number of United States citizens identify simply as "American" on the question of ancestry. The Census Bureau reports the number of people in the United States who reported "American" and no other ancestry increased from 12.4 million in 1990 to 20.2 million in 2000. This increase represents the largest numerical growth of any ethnic group in the United States during the 1990s. In the 1980 census 26% of United States Citizens cited that they were of English ancestry, making them the largest group at the time. Slightly more than half of these individuals would cite that they were of "American" ancestry on subsequent censuses when the option to do so was made available, with areas that "American" ancestry predominates on the 2000 census corresponds to places where "English" predominated on the 1980 census. In the 2000 United States Census 6.9% of the American population chose to self-identify itself as having "American ancestry". The four states in which a plurality of the population reported American ancestry are Arkansas (15.7%), Kentucky (20.7%), Tennessee (17.3%), and West Virginia (18.7%). Sizable percentages of the populations of Alabama (16.8%), Mississippi (14.0%), North Carolina (13.7%), South Carolina (13.7%), Georgia (13.3%), and Indiana (11.8%) also reported American ancestry. Map showing areas in red with high concentration of people who self-report as having "American" ancestry in 2000. In the Southern United States as a whole 11.2% reported "American" ancestry, second only to African American. American was the 4th most common ancestry reported in the Midwest (6.5%) and West (4.1%). All Southern states except for Delaware, Maryland, Florida, and Texas reported 10% or more American, but outside the South, only Missouri and Indiana did so. American was in the top 5 ancestries reported in all Southern states except for Delaware, in 4 Midwestern states bordering the South (Indiana, Kansas, Missouri, Ohio) as well as Iowa, and 6 Northwestern states (Colorado, Idaho, Oregon, Utah, Washington, Wyoming), but only one Northeastern state, Maine. The pattern of areas with high levels of American is similar to that of areas with high levels of not reporting any national ancestry. In the 2014 American Community Survey, German Americans (14.4%), Irish Americans (10.4%), English Americans (7.6%) and Italian Americans (5.4%) were the four largest self-reported European ancestry groups in the United States forming 37.8% of the total population. However, English, Scotch-Irish, and British American demography is considered to be seriously undercounted, as the 6.9% of U.S. Census respondents who self-report and identify simply as "American" are primarily of these ancestries (and of the Scotch-Irish ancestry in particular). Stanley Lieberson and Mary C. Waters write: "As whites become increasingly distant in generations and time from their immigrant ancestors, the tendency to distort, or remember selectively, one’s ethnic origins increases.… [E]thnic categories are social phenomena that over the long run are constantly being redefined and reformulated." Mary C. Waters contends that white Americans of European origin are afforded a wide range of choice: "In a sense, they are constantly given an actual choice—they can either identify themselves with their ethnic ancestry or they can 'melt' into the wider society and call themselves American." Professors Anthony Daniel Perez and Charles Hirschman write: "European national origins are still common among whites—almost 3 of 5 whites name one or more European countries in response to the ancestry question. ... However, a significant share of whites respond that they are simply “American” or leave the ancestry question blank on their census forms. Ethnicity is receding from the consciousness of many white Americans. Because national origins do not count for very much in contemporary America, many whites are content with a simplified Americanized racial identity. The loss of specific ancestral attachments among many white Americans also results from high patterns of intermarriage and ethnic blending among whites of different European stocks." ^ "1-Year Estimates". 2016 American Community Survey. United States Census Bureau. Retrieved November 16, 2017. ^ a b Jack Citrin; David O. Sears (2014). American Identity and the Politics of Multiculturalism. Cambridge University Press. pp. 153–159. ISBN 978-0-521-82883-3. ^ Garrick Bailey; James Peoples (2013). Essentials of Cultural Anthropology. Cengage Learning. p. 215. ISBN 978-1-285-41555-0. ^ Kazimierz J. Zaniewski; Carol J. Rosen (1998). The Atlas of Ethnic Diversity in Wisconsin. Univ of Wisconsin Press. pp. 65–69. ISBN 978-0-299-16070-8. ^ Liz O'Connor, Gus Lubin and Dina Specto (2013). 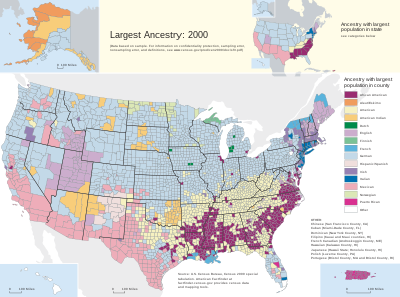 "The Largest Ancestry Groups In The United States - Business Insider". Businessinsider.com. Retrieved April 10, 2017. ^ Jan Harold Brunvand (2006). American Folklore: An Encyclopedia. Routledge. p. 54. ISBN 978-1-135-57878-7. ^ a b c Perez AD, Hirschman C. Changing Racial and Ethnic Composition of the US Population: Emerging American Identities. Population and development review. 2009;35(1):1-51. doi:10.1111/j.1728-4457.2009.00260.x. ^ Celeste Ray (1 February 2014). The New Encyclopedia of Southern Culture: Volume 6: Ethnicity. University of North Carolina Press. pp. 19–. ISBN 978-1-4696-1658-2. ^ a b c "American, n. and adj." (PDF). Oxford English Dictionary. Oxford University Press. ^ a b Thomas G. Dyer (1992). Theodore Roosevelt and the Idea of Race. LSU Press. pp. 78, 131. ISBN 978-0-8071-1808-5. ^ John Higham (2002). Strangers in the Land: Patterns of American Nativism, 1860-1925. Rutgers University Press. pp. 133–136. ISBN 978-0-8135-3123-6. ^ a b c Kaufmann, E. P. (1999). "American Exceptionalism Reconsidered: Anglo-Saxon Ethnogenesis in the "Universal" Nation, 1776–1850". Journal of American Studies. 33 (3): 437–57. JSTOR 27556685. In the case of the United States, the national ethnic group was Anglo-American Protestant ("American"). This was the first European group to "imagine" the territory of the United States as its homeland and trace its genealogy back to New World colonists who rebelled against their mother country. In its mind, the American nation-state, its land, its history, its mission and its Anglo-American people were woven into one great tapestry of the imagination. This social construction considered the United States to be founded by the "Americans", who thereby had title to the land and the mandate to mould the nation (and any immigrants who might enter it) in their own Anglo-Saxon, Protestant self-image. ^ Tyler Anbinder; Tyler Gregory Anbinder (1992). Nativism and Slavery: The Northern Know Nothings and the Politics of the 1850's. Oxford University Press. p. 107. ISBN 978-0-19-507233-4. ^ David M. Kennedy; Lizabeth Cohen; Mel Piehl (2017). The Brief American Pageant: A History of the Republic. Cengage Learning. pp. 218–220. ISBN 978-1-285-19329-8. ^ Ralph Young (2015). Dissent: The History of an American Idea. NYU Press. pp. 268–270. ISBN 978-1-4798-1452-7. ^ Katie Oxx (2013). The Nativist Movement in America: Religious Conflict in the 19th Century. Routledge. p. 88. ISBN 978-1-136-17603-6. ^ Russell Andrew Kazal (2004). Becoming Old Stock: The Paradox of German-American Identity. Princeton University Press. p. 122. ISBN 0-691-05015-5. ^ Mary Ellen Snodgrass (2015). The Civil War Era and Reconstruction: An Encyclopedia of Social, Political, Cultural and Economic History. Routledge. p. 130. ISBN 978-1-317-45791-6. The upsurge of the faithful fueled bigotry among Americans who demonized cities and discounted foreigners, especially Catholics and Jews, as true citizens. Old stock American nativists feared that "papists"
^ Andrew Robertson (2010). Encyclopedia of U.S. Political History. SAGE. p. aa266. ISBN 978-0-87289-320-7. ^ Tyler Anbinder (1992). Nativism and Slavery: The Northern Know Nothings and the Politics of the 1850's. Oxford University Press. pp. 59 (note 18). ISBN 978-0-19-508922-6. ^ Greg Robinson (2009). A Tragedy of Democracy: Japanese Confinement in North America. Columbia University Press. p. 22. ISBN 978-0-231-52012-6. ^ Michael Green; Scott L. Stabler Ph.D. (2015). Ideas and Movements that Shaped America: From the Bill of Rights to "Occupy Wall Street". ABC-CLIO. p. 714. ISBN 978-1-61069-252-6. ^ Kenneth Prewitt (2013). What Is "Your" Race? : The Census and Our Flawed Efforts to Classify Americans. Princeton University Press. p. 177. ISBN 1-4008-4679-X. ^ a b Farley, Reynolds (1991). "The New Census Question about Ancestry: What Did It Tell Us?". Demography. 28 (3): 411. doi:10.2307/2061465. ^ Lieberson, Stanley; Santi, Lawrence (1985). "The Use of Nativity Data to Estimate Ethnic Characteristics and Patterns". Social Science Research. 14 (1): 44–46. doi:10.1016/0049-089X(85)90011-0. ^ a b c Lieberson, Stanley & Waters, Mary C. (1986). "Ethnic Groups in Flux: The Changing Ethnic Responses of American Whites". Annals of the American Academy of Political and Social Science. 487 (79): 82–86. doi:10.1177/0002716286487001004. ^ "Ancestry of the Population by State: 1980 - Table 3" (PDF). Census.gov. 2017. ^ a b Census Atlas of the United States (2013). "Ancestry" (PDF). Retrieved April 10, 2017. ^ "Selected Social Characteristics in the United States (DP02): 2014 American Community Survey 1-Year Estimates". U.S. Census Bureau. Retrieved November 10, 2016. ^ Dominic Pulera (2004). Sharing the Dream: White Males in Multicultural America. A&C Black. pp. 57–60. ISBN 978-0-8264-1643-8. ^ Leyburn, James G. (1962). The Scotch-Irish: A Social History. Chapel Hill, NC: University of North Carolina Press. p. xi. ISBN 978-0807842591. [The Scotch-Irish] were enthusiastic supporters of the American Revolution, and thus were soon thought of as Americans, not as Scotch-Irish; and so they regarded themselves. ^ Lieberson, Stanley (1985). "The Use of Nativity Data to Estimate Ethnic Characteristics and Patterns". Social Science Research. 14 (1): 44–46. doi:10.1016/0049-089X(85)90011-0. ^ Waters, Mary C. (1990). Ethnic Options: Choosing Identities in America. University of California Press. p. 52. ISBN 978-0-520-07083-7. "Ancestry: 2000 (Census 2000 Brief)" (PDF). U.S. Census Bureau. June 2004. Archived from the original (PDF) on 2004-12-04. Retrieved 2017-12-10. Reynolds Farley (August 1991). "The New Census Question about Ancestry: What Did It Tell Us?". Demography. 28 (3): 411–429. doi:10.2307/2061465. PMID 1936376. Archived from the original on July 16, 2009.